Viña Falernia was founded in 1998 after Aldo Olivier Gramola realised the potential for producing superb wines in this semi-arid valley! The Aldo Olivier's family is originally from a small village in northern Italy (Trentino Region) called Dimaro, located on the Alps in a beautiful valley called "Val di Sole". Today is a wonderful place for skiing in the winter and trekking in the summer. In 1951 the Italian economy was drastically failing, so Aldo's father decided to leave their country in order to come to Chile, taking an opportunity with the development plan dealt between the Chilean President - Gabriel Gonzalez Videla and Italian Prime Minister - Alcide Degasperi. In May 1951 the family arrived to the Coquimbo/La Serena region, as one of the 200 families of the colonization. Aldo was 12 years old, the oldest of 7 brothers and after arriving to Chile, he gained 2 more siblings! The Olivier's started their life in the southern hemisphere cultivating vegetables; a few years later Aldo got married and moved from La Serena to a small village located in Elqui Valley, called El Tambo, part of Vicuña district, where he and his wife made the family grow and had 4 children. In 1972 he started planting grape vines for Pisco production (the Chilean national spirit) and a few years later, he established his own Pisco distillery that became quickly the third largest produser in Chile. Two decades later the Falernia project was born, in 1995 after he met his cousin Giorgio Flessati, an oenologist working in the Trentino region in nothern Italy. 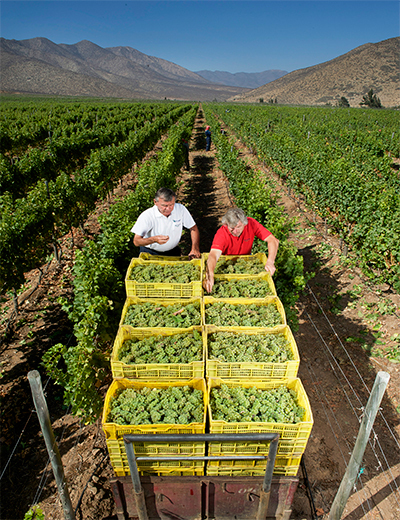 Falernia began as an innovative venture, as it is Chile's most northernly winery estate, a considerable distance from the country's main wine-growing regions. The driving force has been a passion for wine and the challenge of transforming a tract of desert into green vineyards with enormous potential. Utilizing the latest technologies, Viña Falernia has succeded in transforming itself into a Premium wine producer.